Spend a week on an authentic working ranch located in the beautiful Black Hills of Wyoming, U.S.A, This is an honest working cattle ranch where you can actively participate in daily ranch activities. It covers 30,000 acres of land where the family raise and run over 1,200 pairs and approximately 4000 yearlings. Riding in the company of cowboys, you will learn how to move and sort cattle, lasso, brand and canter after the odd escapee. The natural beauty of the place and the typical warm-heartedness of the cowboys will make you feel right at home. – You will have the opportunity to play an active role in the day-to-day tasks on a ranch riding over varied terrain of more than 30,000 acres. – Ride alongside the cowboys, moving cattle, sorting and driving herds to summer and winter pastures. – Enjoy home-cooked meals every day, including delicious local steak. This ride is suited to intermediate and experienced riders. 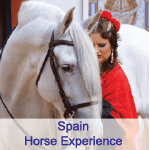 Riders must be at ease at all 4 paces across varied, uneven terrain and be in good physical condition and be comfortable riding for long hours and cantering in open country. There is no weight limit but riders need to be rider fit. Although all paces are used, the majority of interaction with the cattle is done at walk to keep them calm. Gently trotting, or ‘jogging’, is often used for covering long distances. You will spend between 4-8 hours riding, depending on the ranch activities. Children under 8 can ride inside the ranch. Young riders over the age of 8, accompanied by their parents, are welcome to join in all ranch activities on the condition that they fulfill these minimum riding requirements. Please note that there are no ponies – although the Quarter Horses are generally small in size, we recommend children to be at least 1m30 / 4ft2 unless they are used to bigger horses and confident riders. The ranch has more than forty Quarter and Paint horses. They are trained throughout the year by the wranglers and are experienced ranch horses that are used to working with livestock. They spend the year turned out in the pastures living as a herd. You will be asked to groom, tack and untack your horse. You may also be asked to feed and water your horse. Experience of Western riding and cattle work is not compulsory for this holiday. You can enjoy it without any previous experience. If you have never experienced working with cattle, it will take you 3-4 days to feel useful. That’s completely normal. Western saddles are used with front saddle bags and leather straps to fix your jacket to the back of the saddle. Helmets are strongly recommended and a packing list will be provided when you book the ride. The activities at the ranch are designed around what is going on at the ranch to ensure you are getting an authentic experience. During your time at the ranch, you will ride cow horses, enjoy the beautiful outdoors, experience the cowboy lifestyle and most of all have a great time. Sightseeing excursions can also be arranged for a fee. April – July: The main activities at the ranch during this time of year is branding all the baby calves that were born over the winter months. After branding you will drive the cattle out to the summer pasture for grazing. July – August: This time of summer tends to be a little less busy, but there is still plenty of riding to be done. When you are not riding, you will be able to go on hikes and sightseeing tours, swim in the creek that runs through the ranch, attend local rodeos, and go shopping in the nearby towns. This is a perfect time for families to come visit us as well. August – November: After the Cattle have grazed freely during the summer months, it’s time to round up the cattle and take them to be sold and move the remaining cattle to winter grazing pastures, This is a great time to visit the ranch if you enjoy riding horses daily and sorting cattle. Many nights are spent in the Saloon with live music and in the busy season a band comes over 1-2 times a week. It is possible to extend your stay at the ranch or explore the beautiful landscapes of South Dakota; the Black hills, Devil’s tower, Deadwood, Mount Rushmore… Ask us for more information. The accommodation is rustic and homely. The ranch is a cosy ranch style. At the end of a long day falling into a real bed does feel good. There are four rooms in the main ranch house. Two are doubles and two are twin rooms. These rooms share a bathroom. There are also five separate wooden cabins each with it’s own en-suite bathroom. Guests are invited to treat the ranch house as a home from home. The main house is a communal space where you will have your meals each day. Here, you can also choose to relax in front of the fire, listen to music or play snooker. A washing machine and tumble dryer are available for you to use. You will prepare your breakfast and lunch yourself. All the ingredients will be made available to you every morning in the communal kitchen area. Dinners are prepared by the staff and are eaten together. The food is typical “cowboy style” with home-raised meat, potatoes, pasta and vegetables. If you wish to drink alcohol you will have to bring your own as the ranch doesn’t have a licence to sell alcohol. There will be a chance to buy this coming from the airport. No single supplement, subject to availability. Please advise us when booking. Rates are based on the USD dollar and subject to currency fluctuation, so please contact us for the most up to date pricing for your riding holiday. We use the ANZ sell rate to convert to AUD. Transfers are USD$150.00 from Rapid City or Gillette Airport one way for up to 4 people. We reserve the right to alter the itinerary or accommodation, and change horses where necessary, but will keep you informed at all times. – Depending on the month you visit you may get to visit a local Rodeos.